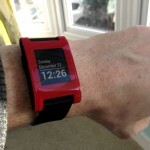 I have a new gadget, a pebble smartwatch. 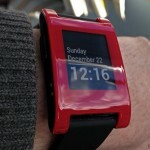 The “smart” moniker seems appropriate because it does something in addition to its primary function (telling the time), and as a platform it has a lot of potential, but like the first few generations of smartphones were merely OK phones, this is only a good digital watch rather than a great one. Why would I want a mini-computer on my wrist when I already have one in my pocket/bag? It seems to me that large screen phones are popular for a reason: they make better computers. Conversely as the screen size increases they lose all the properties that made smartphones attractive in the first place—easily carried always with-you devices. All the major mobile phone makers have launched voice-based interfaces but not only are they slow and error prone, in many cases the desired responses are fundamentally visual. Hence, the idea is a second screen for the phone that can then safely remain zipped away in a secure location. For the moment, notifications. There is some rudimentary fitness tracking if you are into that sort of thing, but even being able to read notifications without getting my phone out of my pocket has turned out to be quite useful. For a start, I often fail to notice calls and texts when walking but the pebble makes them much more prominent. I can also see, with one glance and without taking off a glove, whether it is something urgent, or whether it can be dealt with later. People in the habit of leaving their phone in another part of the house will also find it useful since the bluetooth range easily stretches across a couple of floors. While the pebble can run apps, currently these are mostly of novelty value rather than actually useful. The forthcoming 2.0 API looks a lot more capable and has proof of concept apps for things like displaying the last train departures from the nearest tube station. Notably the pebble does not have any built in speaker, microphone or camera which places it a long way from the significantly more expensive Galaxy Gear. How good a watch is it? Functional. Its e-paper screen means the time is always displayed (if you want it to be) and there is a cool motion sensor activated backlight. I did struggle to find a nice watch face that matched the functionality of my Timex Ironman digital watch, but since many watch faces are open sourced it would have been possible to modify one to my purposes had I not found one. Since the platform is very immature, sifting the good watch faces from the gimmicky was also part of the problem: it is currently not possible to search for something as specific as “digital 24 hours with seconds date and day of week”.1 The lack of built-in applications for what I would consider standard watch functionality is probably the biggest weakness right now. For example my Timex digital watch comes with chronograph, countdown timer and multi-timezone functions by default; for the pebble I had to search for an app and then try different ones out until I found one that worked well. I find many normal watches too bulky for my slim wrists but as you can see from the photo, the pebble fits just about OK—I certainly would not want it any larger. The strap is a standard fitting so can easily be replaced and the battery is claimed to last 5-7 days between charges, which seems accurate based on my usage so far. The pebble is fun and I already find it a useful addition to my every day life. It is by no means essential—yet, that will require several more iterations of both hardware and software—but the pebble proves the concept has utility in the world outside of Silicon Valley’s reality distortion field.